Truth in beauty: There isn’t a single best ingredient for skincare. 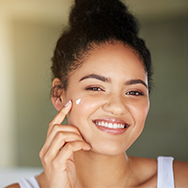 Research has clearly shown that skin needs an abundance of beneficial ingredients, including omega fatty acids, ceramides, and peptides (along with many others), as skin is complicated and needs an array of skin-natural ingredients to look young and healthy. We never want you to worry if you’re getting enough of the best ingredients for your skin. That’s why we only formulate products that contain a mix of brilliant ingredients. The next step is for you to determine which of these ingredients or mix of ingredients is right for you, but it’s not as difficult as it might seem; in fact, it’s a matter of preference and of experimentation to see which ones perform ideally for the results you want. When it comes to our products containing omegas, ceramides, and peptides, the following is what you need to know to help you decide which ones are right for you. What you’ll notice is that these ingredient groups have some similarities and some significant differences. Each individual peptide (and there are many) can educate skin to do something distinctive, like improve the appearance of skin tone, firm, diminish the appearance of wrinkles by encouraging layers of skin to act like younger skin, and maintaining a smooth, healthy-looking surface. Do You Need All of Them? Whether or not you need all of these ingredients depends on your skincare needs and concerns, but certainly they are all great to use and can benefit all skin types. For some skincare needs, if ceramides, peptides, and omegas are all found in one product that’s great. But for advanced concerns, you will want products with concentrated amounts that can be layered with the other products you’re using. If you have dry, dehydrated skin or if your skin is sensitive or prone to redness, you will see the most benefit by using a mix of products that contain omega fatty acids, ceramides, and peptides. If your skin is combination to oily or breakout-prone, omegas are fine, but you’ll likely derive greater benefit from ceramides to balance lipids and peptides because of their multi-faceted benefits—especially if your skin is oily with multiple signs of ageing. Speaking of signs of ageing, all three groups of ingredients will bring about noticeable improvements in your skin, from enhancing resilience to diminishing the look of lines, wrinkles, and uneven texture, and you can begin using them at any age. Experiment with various products that contain these ingredients, layering them all at once or using them on alternate days. We predict you’ll find that each group’s similarities and differences add up to exponentially better skin!